Robert [Bob] Wickboldt (pictured above) is a Chatham Rotarian and Chair of the Club’s Membership Committee. Bob presented the Club’s Program on August 1st. August is Membership Month for Rotary and Bob’s presentation began by discussing some of the challenges that face all service clubs in today’s fast-paced environment. Service clubs include a variety of types of organizations, each with a primary focus; Rotary is just one of many available for service to our community and internationally. Bob noted that many clubs have been faced with declining membership in recent years as the potential pool for members has grown. He provided some statistics that highlighted the trends in service clubs. In the 50’s and 60’s service clubs were open exclusively to men and local business and civic leaders were the majority of their members. Clubs began to find that opening to clubs to women proved to be a positive step. Clubs featured mandatory membership, but as time progressed many found their work schedules and demands on their time often prevented their participation. Adjustments in these standards by clubs really opened the doors to those who wanted to serve. One of the challenges for clubs is getting the word out about who they are and what service and fellowship they provide the community. 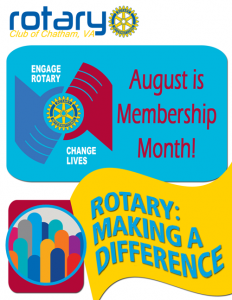 The Chatham Rotary Club has remained a stable, thriving club in the local community featuring many service projects and opportunities for fellowship for members. For a club to thrive there needs to be a positive mix of ages, backgrounds, and interests of the Club members. Bob talked with members about what we can do as a club to keep the interest in Chatham Rotary at a high level. 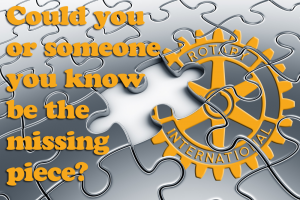 Membership month for Rotary gives us a chance to communicate our mission and service to the community and give others the opportunity to serve and experience the fellowship that our Club knows. Club members suggested ways to meet this goal and set August 22nd as a Club meeting dedicated to inviting potential members to join us and learn the focus of the Club and how they too can become part of the service community in Chatham.